The Order of the Rose for the SCA was founded January 6, 1968 (A.S. II) by Queen Sheryl of Thespis (now known as Countess Amina Sherana de Talavera) to honor those who had been Queen or who had been the lady to a fighter who had won one of the first tourneys when there were no queens. Today, this Order exists throughout the Known World. In the Caidan Coronation ceremony, when the reigning Queen steps down and becomes a Countess, the newly-crowned Queen presents her with a yellow rose, which is the traditional symbol of a queen in the SCA. As the new Countess received a golden rose when she stepped up, she now receives it as a token of her inclusion in the SCA-wide Order, with the words, "Be welcomed into the Order of the Rose, whose token this is." One of the most important events the Ladies of the Rose sponsor is the annual Valkyrie Rose Tournament. Ladies of the Rose at the Valkyrie Rose Tournament, Great Western War 2016. Click on the photo to see who's who. The Ladies of the Rose at the Valkyrie Rose Tournament, GWW 2014. Click on the photo to see who's who. TRM Adam Makandro and Stæina, were crowned at 12th Night & Winter Coronation 2019, January 5, 2019, in the Barony of Lyondemere. Princess Tsyra. TRH Wilhelm Skallagrimsson and Tsyra tsheere Nanoup became Heirs to the Crescent Thrones at Spring Crown Tournament, March 23, 2019 in the Barony of Starkhafn. Their Coronation will be July 13, 2019 in Wintermist. Ladies who have reigned at least twice as Queen of Caid. Those who have reigned once as Queen or Royal Consort of Caid. Ladies who reigned as Princess of Caid when it was a Principality of the West Kingdom are also members of the Caidan Order of the Rose. As a courtesy, all former Royal ladies who live in Caid are invited to join the Caidan Order of the Rose while they reside in our realm. These ladies have resided in Caid but have since moved to other realms. 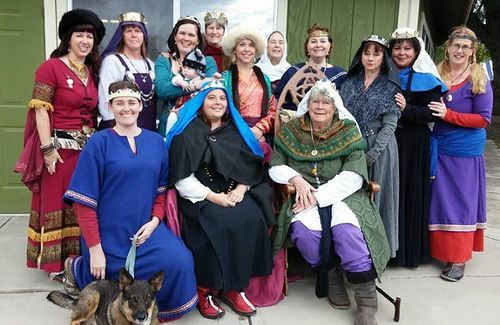 Traditionally, the Crown Princess is honored by the Ladies of the Rose in Caid at an afternoon gathering hosted by her "grandmama" (the current Queen's predecessor.) This is a time for the Ladies of the Rose to reminisce about Caid's history and share their assembled wit and wisdom with the Crown Princess. The Ladies of the Rose prepare the rose and rosemary wreaths which are bestowed upon the victor of the Lists and his/her consort. At Closing Court, the Ladies of the Rose come forward and present roses to the assembled royalty. 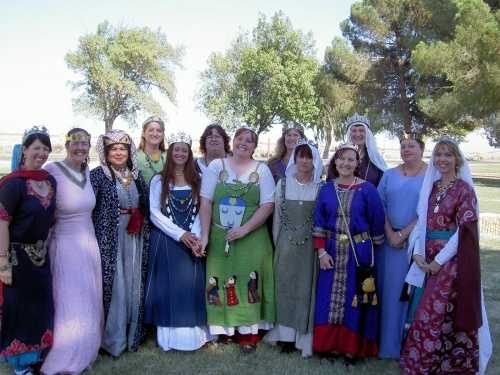 Customarily, the Queen invites all the Ladies of the Rose present at the Queen's Champion Tourney (the day after Coronation) to accompany Her as she processes around the field to greet Her new subjects. When a Queen becomes a Countess or Duchess, she is entitled to a procession which often includes Ladies of the Rose whom she chooses to accompany her and participate in the ceremony. One of main projects that the Caidan Roses oversee is the care, refurbishment, and retirement of the Kingdom Regalia. The Kingdom Regalia Officer is Viscountess Lorissa du Griffin. Hosting the Valkyrie Rose Tournament at GWW. The Ladies of the Rose support the efforts of the Chronicler's Office by providing raffle baskets that cover a wide range of SCA interests. The following are the Ladies of the Rose who have accepted the responsibility for various activities related to the members of the Order in Caid. The Rose Liaison handles all official business relating to the Order of the Rose in Caid, especially correspondence, as well as regalia storage and delivery. The Webwright updates the Caidan Roses web site and this wiki page. Please send all pictures and corrections to her. Organizer of the assembly, materials and constructions of the wreaths for Crown tournaments. Knowing the surpassing skill of Caid's artisans, it was the desire of the Ladies of the Rose to highlight them through the creation of an additional set of Crowns to complement those already part of the Royal Regalia. In December 2012, the design submitted by Maestra Flavia Beatrice Carmigniani was chosen, and Master Otuell Gowe began work on the new Crowns. Based on an authentic "plaque" design, the new crowns were completed in 2014. The Compendium Caidis Editor-in-Chief THL Lachlan Cromarty and his team of editors are working tirelessly to detail Caid's history in words and pictures here on the wiki. If you wish to become part of the effort, contact him at caidhistory@sca-caid.org. As of 01/07/2017, Baroness Catharine Hawkwod da Barbiano will step up as Caid's first official Historian. She may also be reached at that email address.